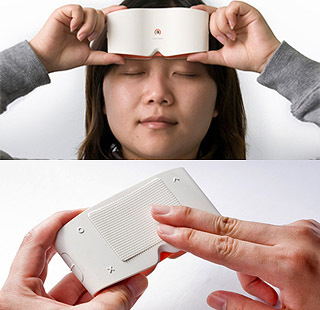 Touch Sight, a fascinating “camera” for blind people. For my entire design career,Â my colleagues and I have wrestled with the terminology we use to segment and focus our work, both in our careers and in our critiques. Whether it’s the “information architecture vs. interaction design” debate or the “visual design vs. graphic design” debate, our neat little linguistic boxes don’t always seem to be able to contain the conversations we have about our work. The term “look and feel” has been particularly troublesome. Too often it is used to simply mean “visual design” — that is, just the “look” part — with the “feel” part understood as simply a polite nod to the fact that visual design has an emotional aspect. Andrew Crow at Adaptive Path suggests that, because of this kind of abuse, “look and feel” should be discarded. I propose that we never use the phrase â€œlook and feelâ€ again. Ever. Visual design is often subjective and can be difficult to describe or judge. Often, people lack the language or understanding of the work to accurately express their opinions. Consequently, we use simple terms of the way an object â€œlooksâ€ or how it â€œfeelsâ€. Speaking in terms of these qualities does a disservice to the design. We cheapen the value of the work by paying attention only to the superficial aspects. I think he’s being a little hasty. How is the term “visual design”, which Andrew uses here and repeatedly throughout his essay, any better than “look and feel”? “Look and feel” at least suggests (indeed specifically acknowledges) that the surface-level user experience involves more senses than just the visual. In contrast, “visual design” often dramatically constrains the conversation about our work, and indeed might even constrain the scope of responsibility for a person working under that title. I’ve always interpreted the “feel” part of look and feel to mean not just the emotional aspects that are usually associated with it, but also the tactile (or seemingly-tactile) effects of how a UI moves and transforms, how it sounds, the speed and pacing of the unfolding experience, its overall voice and personality, and countless other ineffable qualities of visceral experience. “Feel” can include words and language, transitions, motion, rhythm, haptic feedback, symbolism, melody, texture, temperature, and much more. So while I agree that “look and feel” is often abused, it is precisely the conflation of (a) the vast potential of that term with (b) simply equating it with “visual design” that is the essence of the problem. Replacing “look and feel” with just “visual design”, as Andrew seems to perhaps unintentionally suggest, would only make matters worse. The scope of the term “visual design” simply cannot contain those aforementioned ineffable aspects of user experience, which is why we cling to “look and feel”. While I confess to using both terms every day, I do think they are often insufficient for effective design communication. But simply throwing away “look and feel” isn’t a solution. We either need a more powerful and understandable replacement for “look and feel”, or we need to do a better job investing the conversation around “look and feel” to include those ineffable qualities. We need to ensure that we can have broad critical conversations about what Christopher Alexander calls “The Quality Without a Name” (QWAN) and that we can have narrow and focused critical conversations around the technical nuances of visual and graphic design. I’m conservatively inclined towards the second approach: evangelizing a new and broader understanding of what “look and feel” means in the universe of interaction design. But I’ll admit that, Alexander’s declaration of namelessness notwithstanding, I am quietly and subconciously thinking of new names. Previous Previous post: Who Watches the Watchman? 10 Responses to See. Feel. In the idea sense we’re Experience Designers – which really encompasses it all. The real challenge is not what we call ourselves though, it’s how clients understand what we do. And unfortunately for now what they understand best is: IAs and Designers. Tell a client that there’s an Interaction Designer or a User Experience Designer on their team and their brow furrows — well, most do anyway. Then of course there’s the growing bleeding of the skillsets and roles – where does IA/ID stop and Design begin? That of course should discourage us for trudging ahead though. I am sure you meant “shouldn’t discourage us”, no? doh. yes … and “idea” should be “ideal” … seem to be a bit challenged with the English language this morning. I agree! Not only does “look and feel” evoke many aspects of the experience from a sensory (and therefore user-centered!) point of view, it’s a description of a part of the experience, rather than a role in the design process. As a UX designer who was trained in the visual, I cringe at the term “visual design,” because to me it connotes the very sense of superficiality Mr. Crow is lamenting; an indirect expression of a view of design in which visual elements are afterthoughts rather than integral components of the core experience. In my experience there is subtle difference in how these terms get used, or what people are trying to differentiate or communicate when they use them. I agree that look and feel as a term has within it the potential to mean something quite deep, and perhaps even capture the experiences that we are trying to find words for. When it gets thrown around within the design process – “do a look and feel” – it sometimes seem to loose this power or value. Possibly because look and feel in practice – in online anyway – actually translates (often) into showing the client different look and feels, which are in fact several static screens, which loose all the subtlety of “feel” that you evoke here Christopher. This convention (or hangover from the convention if you’ve moved on) sort of negates some of the richness of what look and feel could mean. Same with the (slowly dissolving) convention of understanding user experience as bounded by ‘pages’. For me anyway when I use the term visual design, usually I am not trying to describe the experiential aspect of ‘look and feel’ but differentiate between roles and stages of design. While the whole thing might be UX (? ), we seem to need to communicate at a more granular level than that when we are actually trying to plan and communicate about the actual process and activities involved in doing design. I say visual design, in order to differentiate it from other kinds of design like affinity mapping and walkthroughs and cards sorts and wireframes, ia maps which are abstracted to some degree.~. Visual design (can) imply real colours, real pixels, “finished” graphics, css or html – visual design (can) mean we are starting to cast things in concrete, committed to actual implementation and concreteness. It’s the way we get to implement and communicate the “look and feel”. At least through the tools we have now (photoshop etc). I’m not saying its the right term or even the right differentiation, but that there is something in the specificity, levels of granularity and activities within design that seem important. Fahey wrote: “I’ve always interpreted the ‘feel’ part of look and feel to meanâ€¦ how a UI moves and transforms, how it sounds, the speed and pacing.” Me too. The feel of a software app comes from using it, not looking at it. It comes from how the app interacts with the user. In other words, the “look” is the visual design and the “feel” is the interaction design. So “look and feel” is a pretty good laymanâ€™s summary of what user interface design is about. Pretty profound for just three syllables. However, I also agree that the phrase makes our work sound relatively trivial. In the physical world, the look and feel of a product is determined mostly by its surface. The phrase makes UI design sounds like a veneer over the app, rather than being what defines the app for the user. Personally, I avoid the phrase. I think the term “visual design” puts a box around graphic design and communication design practice, and limits them to skinning apps, rather than an integral players within experience design teams. The same goes for “visually pleasing” or “aestehtically pleasing”. These terms have been attributed only to how good-looking something appears to be. But if we look deeper ionto aesthetics, it’s about how things move us, nost just how they appear to us. About the experience things. I think “look-and-feel” is okay, as long as we (as designers) are able to focus our communications and our conversations with our sketches/mockups on how the thing we are designing might feel like as an experience, not just as an object to admire from afar. Seefeel! Nice track choice. Wonderful soundtrack for designing and writing. I once worked under a creative director who was certain that “look” indicated a page’s design and “feel” is how it makes you feel as a user. We did not see eye to eye on this particular topic. I pretty much stopped using the phrase after that. Too much potential confusion.